Together with ICLEI President Park Wonsoon (Mayor of Seoul), ICLEI First Vice President James Nxumalo (Mayor of Durban) and ICLEI Secretary General Gino Van Begin, 100 mayors from around the world were onstage at today´s ICLEI World Congress 2015 Opening Plenary to adopt the Seoul Declaration. The Seoul Declaration (ES) is a collaborative document that sets out a path to urban sustainability. It acknowledges the grave issues facing our world today and establishes how cities can change in response. The Seoul Declaration is linked to ICLEI´s new Strategic Plan 2015-2021, which will be adopted tomorrow. UN Secretary-General Ban Ki-moon began the session by delivering a message commending Mayor Park Wonsoon for his leadership on urban sustainability. Ban Ki-moon expressed his belief that cities would drive a global transformation and encouraged them to strengthen their networks. A number of Mayors made short speeches endorsing the Seoul Declaration and explaining why the various aspects were important. Mayor Jürgen Nimptsch of the City of Bonn highlighted the contribution of the carbonn Climate Registry – the world´s largest database on local and subnational climate action, and the central repository for the Compact of Mayors. James Nxumalo, the Mayor of Durban and ICLEI Vice President, welcomed the commitment of the Seoul Declaration to new cooperation initiatives between cities and small island states on adaptation and resilience. Mayor Parks Tau of Johannesburg praised the emphasis on EcoMobility and reminded participants that Johannesburg will host the second EcoMobility World Festival in October 2015, during which the Central Business District of the city will be closed to cars. Mayor Kinlay Dorjee of Thimphu, Bhutan, described how Bhutan has established a Gross National Happiness index, introducing meditation and the study of green initiatives in schools. Maimunah Mohd Sharif – the Municipal President of Seberang Perai, Malaysia – reiterated her hope for an Urban SDG and invited all cities to scale up best practices to ensure a transformation to global sustainability. 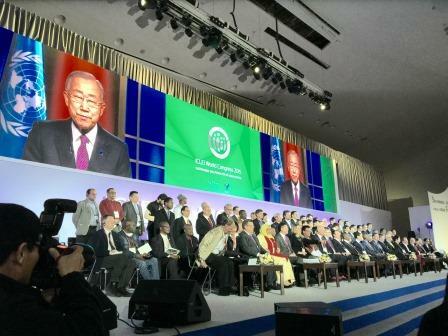 A range of other Mayors spoke in support of the Seoul Declaration, including Chinese Mayors Baocheng Yuan (Dongguan) and Ningfeng Ji (Guiyang). ICLEI President Mayor Park Wonsoon of Seoul closed the session by mentioning the Seoul Action Plan, which will set out concrete plans for climate change mitigation. Mayor Park expressed his belief that the Seoul Action Plan would allow cities to make significant progress before the COP21 in Paris in December 2015, putting pressure on national governments to reach a binding agreement. Please download the Seoul Declaration, available in English here and in Spanish here.